Дополнение: Хронограф. Запас хода 44 часа. Простая застежка. IWC Pilots Chronograph IW377701 Size	Mens Case Material	Stainless Steel Dial Color	Black Bracelet/Strap Alligator/Crocodile Leather Black Clasp Type	Tang Buckle Movement	Automatic Chronograph Screw Down Crown	Yes Bezel	Fixed Crystal	Scratch Resistant Sapphire Case Back	Solid Water Resistant	60m/195ft Case Diameter	43mm Case Thickness	15mm Stainless steel case with a brushed/satin finish & polished steel crown & chronograph buttons. Dial: Matte black main dial. Sub-dial are slightly recessed & with a fine concentric circle textured pattern. Hour markers: combination of Arabic numeral & indexes with a bold triangle at the 12 o'clock position. Quarter-hour markers are luminous. White painted minute track. Black hands with luminous fill. Chronograph/Stopwatch function: Large white central hand seconds counter 30 minute sub-dial counter located at the 12 o'clock position. 12 hour sub-dial counter located at the 6 o'clock position. Day & date window located at the 3 o'clock position (elongated date window). Small seconds sub-dial (red hand) located at the 9 o'clock position. IWC Caliber 79320, beats at 28,800 vph, contains 25 Jewels & has an approximate power reserve of 44 hours. Features an inner soft iron case for additional protection against magnetic fields. 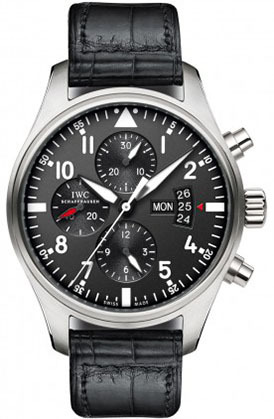 Есть вопросы по IWC Pilot's Watch Chronograph IW377701?